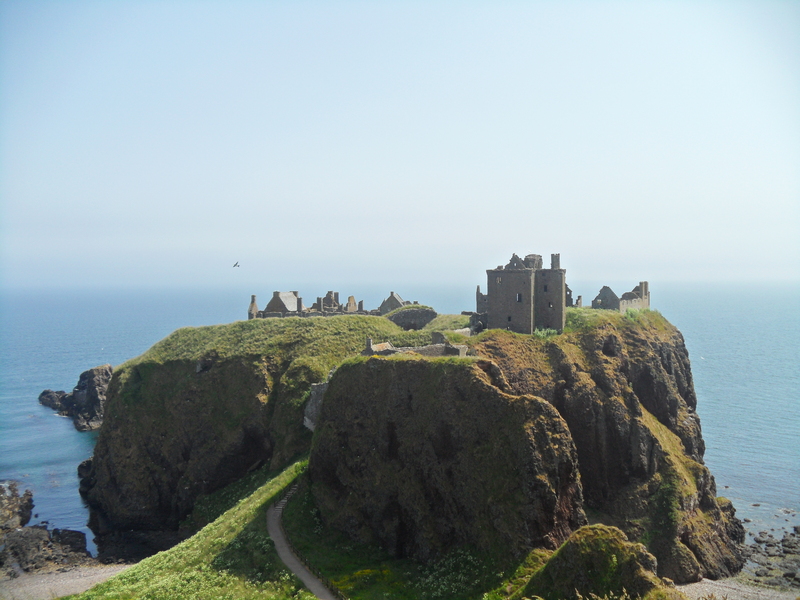 Dunnottar Castle lies a few miles away from the town of Stonehaven on Scotland’s north east coast. As soon as you catch a glimpse of it, it is easy to understand why the rocky outcrop on which the castle stands has been considered of such strategic importance that a castle has stood here for over 1300 years. The first castle would have been a timber fort, built by the picts. Unfortunately, as the picts left almost no written records little is known about the original fort other than it was of significant importance in defending against attacks by the vikings and the Angles. The fort is believed to have finally been defeated and destroyed in the 9th century by the vikings during an attack which it is said also resulted in the death of King Donald II of Scotland. The fort was rebuilt, and continued to play an important defensive role. The first stone building on the site was the church, constructed in the 13th century. The castle continued to be seen of such strategical importance that some of the heavyweights of British history are directly associated with it. King Edward 1st of England successfully took the castle during the wars of independence, but a year later the castle was taken back by the Scots, led by none other than William Wallace, who allegedly burned the English forces alive in the church. In 1651, Oliver Cromwell led a force against the castle after learning that the Scottish Crown Jewels were being held there. His army attacked the castle for over 8 months, yet, due to it’s natural and built defences, a group of just 70 Scots managed to hold it. It was not until Cromwell brought in heavy guns and shelled the castle for 10 days that it was finally surrendered, but by then the crown jewels had already been smuggled out so it was a pointless exercise, other than the castle was destroyed and never fully rebuilt. With such a long and bloody history, it is not surprising that there reports of hauntings in the castle, the most common being screams of agony and despair. This is associated with the building being used as a prison many years after Cromwell’s attack. 180 men and women were held prisoner in the cellar of one of the buildings for 2 months due to their opposition to the Stuart kings. They were kept with no natural light, ventilation or sanitation in the crammed room. The conditions were so bad, 37 swore and oath to the Stuart kings in return for their freedom, 25 attempted to escape, with 15 being recaptured and 2 falling to their deaths, and 5 died from the conditions inside the vault. Those that survived were shipped to the West Indies, but they were by then in such poor health many did not survive the journey. The castle is a truly fascinating place to visit and, as for future uses, well I know where I’m heading if there is ever a zombie apocalypse! This entry was posted on July 11, 2013 at 10:50 pm and is filed under Uncategorized with tags Castle, Dunottar, Edward first, Ghost, haunted, Scotland, Vikings, William Wallace, zombie. You can follow any responses to this entry through the RSS 2.0 feed. You can leave a response, or trackback from your own site.